Pawn Shops are one of the oldest professions dating back to early civilization. A Pawnshop is a place of business where a person who is in need of cash can take their personal property and receive a cash loan. Pawnshop laws and regulations vary from State to State, City To City. Typically the Pawnbroker allows the person pawning the item (Pawnee) a time frame, usually 90 days (some states allow up to four months) to redeem his or her property. Within this time period the Pawnbroker is not allowed to sell the item in pawn but must hold on to the property for a period stated in loan contract. It is the responsibility of the Pawnee to redeem his or her property within the loan period. Once the loan date has expired, if the Pawnee did not redeem his property, the Pawnbroker is now free to sell the property and recuperate his money. When receiving a cash loan at a pawnshop the Pawnee can expect to repay back the loan amount plus interest and fee’s. Interest and Fee’s vary, and largely depend on the actual loan amount. For example if you receive a $100 loan for your property, it will cost you $123.00 to redeem your property. You pay back the original loan amount, $100 plus $23 dollars of fee’s and interest. Let’s say you are the Pawnee and your loan is about to expire, and you do not want to lose your property, what can you do? Typically if the Pawnee comes on or before the due date and does not have all the cash to redeem their property, the Pawnee can pay the interest fee’s and that will extend his loan for another 90 days. Here is an example I borrowed $100 for my item of value, my interest is $23, so my total cost to redeem my property is $123.00. My loan date is about to expire and I do not have $123 to redeem my item, all I have to do is pay $23 (interest and fee’s) and that will extend my loan for another 90 days. Pawnshops only deal with items of value. Therefore you can expect your valuables to be locked up in a vault or safe, especially if your pawning jewelry. Because the pawn loan is a period of 3 – 4 months depending on your state, many people use a pawn shop to store their jewelry. It is unlikely that a pawnshop will get robbed, some people feel their jewelry is safer at a pawnshop, locked in a safe rather than in their home, in a jewelry box. Now that you know what is a pawnshop and how they operate, we invite you to visit us. We are opened 7 days a week! Need cash? Forget wasting your gas driving around looking for a place to sell your gold! Mobile Gold Buyers has a full service armored truck that will go to your location and make you a cash offer for your gold! We service all greater Los Angeles and Los Angeles County. We buy gold, silver, and platinum jewelry. We pay cash for 10k, 14k, 18k, and 22k gold jewelry. 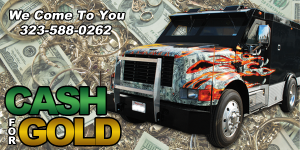 Our cash for gold truck is safe, fast, and reliable! We do not go soliciting door to door, we arrive on an appointment basis only. Here is a list of cities our truck services, if your city is not listed below please call. Gold Exchange Pawn Shop is located approximately 2 miles from the city of Cudahy, Ca. We are the largest Pawn Shop near Cudahy, CA that offers the community a variety of financial services. For your convenience we are opened 7 days from 9am – 7pm. 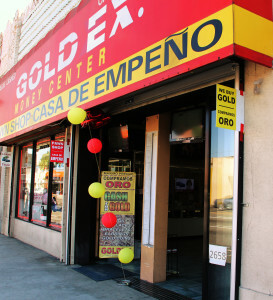 Our pawn shop near Cudahy is approximately 2 miles from Santa Ana St.
Gold Exchange Pawn Shop is located approximately 4 miles from the city of Downey, Ca. We are the largest Pawn Shop near Downey that offers the community a variety of services. Our customers come from surrounding cities because they are able to do all their transactions in one place. We BUY & PAWN Gold Jewelry, Electronic Devices, and Designer Handbags. With the price of gold reaching record highs, many people have caught gold rush fever! Did you know most people are not aware that they own any gold jewelry? Gold Exchange has been in the Cash For Gold business since 1979. We buy gold, silver, and platinum jewelry at competitive prices. We understand that your jewelry may have sentimental value and you are not in the market to sell. If you need quick cash consider getting a loan against your jewelry! Our cash loans are available for up to four months with a low interest rate! The sooner you redeem your property, the less expensive it will be! Our pawn shop near Downey, CA is approximately 4 miles from Downey Landing, and Stonewood Mall. Gold Exchange Pawn Shop is located approximately 3 miles from the city of Bell Gardens, Ca. We are the largest Pawn Shop near Bell Gardens, CA that offers the community a variety of financial services. For your convenience we are opened 7 days from 9am – 7pm. Our pawn shop near Bell Gardens is approximately 2 miles from Eastern Ave, and the Bicycle Club Casino in Bell Gardens, CA. Bell Gardens is a city in Los Angeles county. It is 1 of only 6 cities that permits casino gambling. Bell Gardens High School (Home Of The Lancers) belongs to the Montebello Unified School District. According to US Census in 2010 Bell Gardens, CA is considered high populous Latino community. Gold Exchange Pawn Shop is located approximately 4 miles from the city of South Gate, Ca. We are the largest Pawn Shop near South Gate, CA that offers the community a variety of financial services. For your convenience we are opened 7 days from 9am – 7pm. Our pawn shop near South Gate is approximately 3 miles from Tweedy Blvd, Firestone Blvd, and Azalea Shopping Center.